The leading Microsoft Exchange Server and Office 365 resource site. Windows Server 2012 / 2008 / 2003 & Windows 8 / 7 networking resource site. Cloud Computing Resource Site for IT Pros. An independent Amazon Web Services resource site. ServerFiles.com is a server software & hardware directory for Network administrators & IT professionals, listing networking & server software for Windows 2003, Windows 2000, NT and Linux; and now also listing networking hardware solutions focused on server based computing. GFI MailEssentials is an award-winning email antivirus and anti-spam software solution for Exchange Server and other mail servers, which protects your network against email-borne viruses and other malware threats and delivers a spam capture rate of over 99%. It filters out spam email, phishing scams and viruses through various security layers, including up to 5 antivirus scanning engines and multiple anti-spam filtering technologies – such as two frequently updated anti-spam engines that require no tweaking, IP reputation filtering, greylisting, directory harvesting attack protection and more. It is managed via an integrated web-based configuration and management console and dashboard. Download a free 30-day trial from our website. modusGate is a complete inbound and outbound Windows-based email security gateway designed to protect existing Microsoft Exchange 2000-2010 servers against spam, viruses, phishing, botnets, fraud and other electronic threats. directQuarantine is an Outlook add-on module for modusGate that provides end-user control of quarantine emails directly from Outlook. Certified with the VBspam award, modusGate's multiple anti-spam and anti-virus engines yield a proven high catch rate and negligible false positives. With directQuarantine, administrators save time by putting the task of email quarantine management into the hands of end-users. Installation and maintenance are kept to a minimum with LDAP and ActiveDirectory integration. Additional features include multiple deployment options, mail server routes, redundancy, delegation, email disclaimer and footer control and VMware Ready certification for virtualization. A fully functional 30-day free trial version is available for download and evaluation. Unleash the full power of the Exchange 2003/2007/2010 built-in anti-spam filtering. The Exchange Intelligent Message Filter (IMF)/Content Filter is bottled in an interface exposing minimal functionality. IMF Tune changes this, rendering it a full featured, commercial grade, anti-spam solution. Emails may be white/black listed based on various criteria. 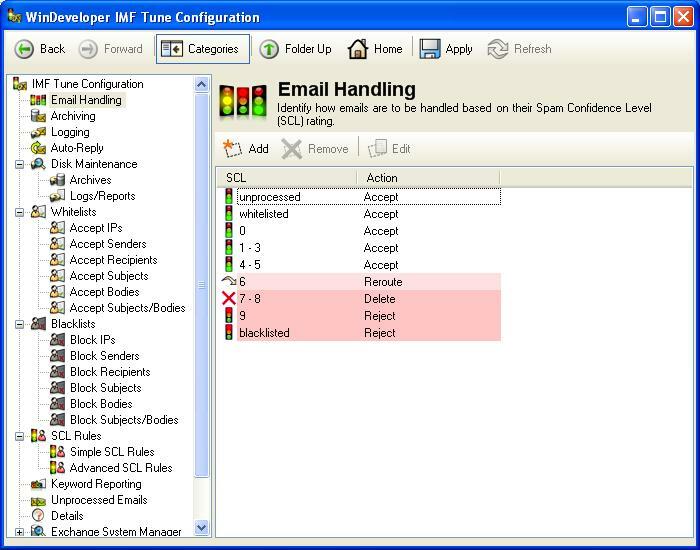 Each of the IMF SCL ratings is configurable enabling granular email handling. For each SCL one may setup archiving, logging, auto-replies, attachment stripping, insertion of SCL into the email subject and more. The selection of emails handling actions enables SCL based rejection, deletion and rerouting. The ability to setup filtering Rules composed of multiple conditions and exceptions adds further flexibility. In this manner one can simply increment/decrement the SCL rating on finding specific keywords. Otherwise one can fix the SCL rating to some value forcing the email to be deposited to the Junk Email folder. SEM is powered by 7.232.775 SPAMfighters from 228 countries/areas. If enough SPAMfighters report the same spam mail, it is instantly removed from all SPAMfighters and SEM users. This means instant spam protection with no configuration or maintenance. SPAMfighter Exchange module perfectly integrates with Microsoft Exchange Server, allowing for easy installation/administration and does not require client side software. The XWall is a server based spam filter that works. It's that simple. Ask anybody or try it yourself. XWall for Microsoft Exchange (5.5, 2000, 2003, 2007, 2010 including SB versions 32/64bit) and standard SMTP mail servers offers a wide variety of filters to combat spam, junk mail, email viruses, dangerous attachments and many other undesired email situations. XWall may attach disclaimers to outgoing email, and can archive all in and outgoing email. XWall keeps a detailed daily log including several informative statistics. XWall works with Microsoft Server NT4, 2000, 2003, 2008 Standard, Enterprise and Small Business. It also can be placed on a MS Home server, 2000 Pro, XP or Vista workstation. Microsoft may limit the number of connections on some workstation OS. XWall is available in 32 and 64 bit versions. SpamTitan software allows you to create an email appliance for your gateway offering protection from Viruses, Spam, Malware, Phishing and unwanted content. Available as a free 30 day download, SpamTitan blocks in excess of 98.5% of spam. It includes Kaspersky Labs and Clam Anti Virus. Features include end user quarantine reports, in and out bound scanning, disclaimers, and a full reporting suite. All updating is automated ensuring the lowest possible management overhead. SpamTitan ISO is a complete operating system and antispam application bundled to offer a simply deployed gateway solution. It allows the customer all the benefits associated with a traditional hardware gateway appliance but with the further advantage of the control of their own hardware. SpamTitan software allows you to create a certified virtual email appliance for your gateway offering protection from Viruses, Spam, Malware, Phishing and unwanted content. Available as a free 30 day download, SpamTitan blocks in excess of 98.5% of spam. It includes Kaspersky Labs and Clam AV. Features include end user quarantine reports, in and out bound scanning, disclaimers, and a full reporting suite. All updating is automated ensuring the lowest possible management overhead. SpamTitan for VMware is one of the first Virtual Appliances on the market. It allows the customer all the benefits associated with a traditional hardware gateway appliance but even further advantages of virtualization including ease of deployment, back up and redundancy and cost savings. SpamTitan is a certified VMware Appliance. Kaspersky Security for Mail Server is a solution that protects mail servers and groupware servers from malicious programs and spam. The product includes applications that protect all popular mail servers, including Microsoft Exchange, Lotus Notes/Domino, Sendmail, Qmail, Postfix and Exim. The solution can also be used to set up a dedicated mail gateway. ORF Enterprise Edition is an anti-spam solution that helps you to block spam before it reaches your network. ORF uses a combination of anti-spam technologies and custom filtering options to stop the spam on SMTP protocol level. ORF can be used with Microsoft Exchange Servers and the IIS SMTP Service shipped with Microsoft Windows. Trend Micro ScanMail for Microsoft Exchange guards against viruses, Trojans, worms, and other malicious code hidden in email attachments. By filtering inbound/outbound SMTP connector-level traffic, it blocks threats before they can enter or leave the mail server. For additional security, Trend Micro ScanMail Suite for Microsoft Exchange combines virus protection with new anti-spam and advanced content filtering technology. A centralized management console makes it easy to deploy group configurations, scan settings, notifications, and automatic updates—across all Exchange servers.